IAM Local 701 auto mechanics, along with volunteers, strike to protect their pensions at Roesch Ford and Roesch Ford Trucking Center in Bensenville, IL. Photo courtesy of Ryan Kelly of IAM Local 126. IAM Local 701 auto mechanics working at Roesch Ford and Roesch Ford Trucking Center in Bensenville, IL walked out on strike Thursday, November 10, 2016 when the employees voted not to accept the owner, Dan Roesch’s, offer of a 14-month “extension contract” providing the same terms as the contract which expired July 31st. There is some history of Roesch coming after his mechanics’ contract, says LePinske. Prior to this last agreement, the dealership was covered under the industry standard contract, the Standard Automotive Agreement (SAA). Roesch purchased what was then Elmhurst Ford. During the purchase Roesch had the right to negotiate a new bargaining agreement and he took advantage of the economic downturn and high unemployment to gut the workers’ agreement. “Among the worse provisions of the previous agreement was a move to ‘seniority by productivity,’ a change which effectively cost the workers their seniority, as work flow and productivity can easily be manipulated by management,” said LePinske. “Seniority provisions are intended to protect workers who have been with an employer from lay-off based on their date of hire. Naturally as mechanics age, their productivity tends to go down. In a ‘seniority by productivity’ situation, the employer could lay off the employee who has been in service the longest as they slow due to the effects of aging. In addition to the pension problem and the seniority language, high health insurance premium co-pays were other issues the IAM brought to the table that the employer was unwilling to discuss. With the expiration of the SAA on the horizon in August 2017, Local 701 Directing Business Representative Sam Cicinelli and the rest of the business representatives are not interested in moving local membership backwards. 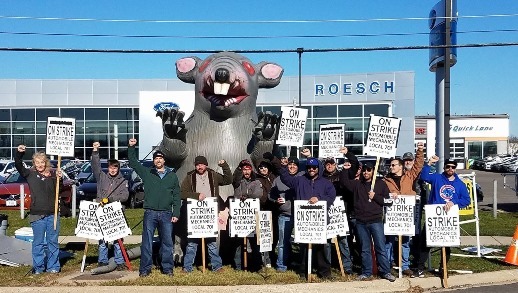 It should be noted that the Mechanics at Roesch Volkswagen are not on strike – only the mechanics at Roesch Ford and the Roesch Ford Truck Center are on strike. Members and supporters are encouraged to stop by the strike line to show their solidarity. Roesch Ford is located at 333 W. Grand Ave. in Bensenville, IL.